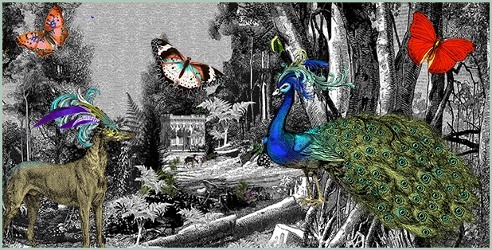 Penhaligon's big fall launch is a quartet of fragrances called Portraits: Chapter 1. Two of them are feminine scents, two are masculine, and they've been given names and characters that evoke British mystery novels and period soap operas like "Upstairs, Downstairs." Penhaligon's tells us that the Portraits collection captures the brand's "ultimately British, slightly eccentric, traditional, adventurous and aristocratic character." Yesterday Kevin reviewed the two "men" of the group, The Tragedy of Lord George and Much Ado About the Duke, and in another "his-and-hers" follow-up, I'm here to cover the women. First I "met" Lord George's wife, Lady Blanche, who is described as "a picture of devotion, charm – and criminal intentions. A social butterfly with a dangerous bite, one might say." The Revenge of Lady Blanche is a "green floral" developed by perfumer Daphné Bugey, with notes of narcissus, angelica, ginger flower, hyacinth and iris. I didn't find Lady Blanche dangerous at all; it's a green floral, but it's shampoo-fresh rather than a sharp or narcotic. I get lots of soapy lilac and honeyed hyacinth, and maybe a whisper of rose, but the overall effect is really more "haircare" than "perfume." The dry down is a greenish iris. The base has hints of sandalwood and vanilla, and it's still slightly soapy. I suppose "Blanche" — meaning "white" — is the right name for this Lady. The second woman of the Portraits quartet is the Lady Blanche's daughter, the Coveted Duchess Rose, trapped in an unsatisfying marriage to Duke Nelson (of Much Ado about the Duke): "Her bosom is aching for release from the corsets of Victorian life. . . .When one’s husband is at the theatre every evening, one does become terribly bored. . ." Her fragrance is a "woody rose" with notes of mandarin, rose and musky wood, developed by perfumer Christophe Raynaud. I was glad to find that Duchess Rose's floral heart is a "red"-smelling rose, not one of the watery "pink" rose flankers that appear at mainstream fragrance counters every spring. At first, the rose smells almost wine-y, and it's complemented for a while by a dusting of black pepper. Then it evolves into a more straightforward floral accord; still rose, but softer and more jammy, and nestled into sheer woods and very sheer musk. The Coveted Duchess Rose makes me echo Kevin's thoughts about The Tragedy of Lord George: "I like it. But then there's the 'luxury' price..." The prices for the Portraits did make me blink. These are pleasant fragrances, and I like the concept and the visuals; but for less money, you could pick up the classic green floral Guerlain Chamade or a beautiful thorny-rose scent like Serge Lutens La Fille de Berlin. For this price, I need to smell something I've never smelled before. The Portraits are charming but familiar-feeling, like the plot of a British murder mystery. Suggested reading: Luca Turin's recent blog post on niche perfumery's rising prices. Penhaligon's Portraits Chapter 1 The Revenge of Lady Blanche and The Coveted Duchess Rose are available in 75 ml Eau de Parfum, £178. 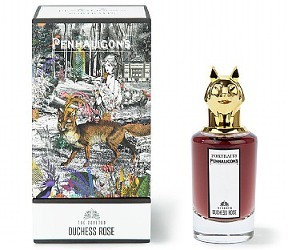 For buying information, see the listing for Penhaligon’s under Perfume Houses. I would call these “Much Ado About Nothing”. Thanks for the reviews and for saving me money. Oh well, we aren’t the target market for these things. They are aimed at people with more dollars than sense. And I can’t maintain any interest after hearing that the collection captures the brand’s “ultimately British, slightly eccentric, traditional, adventurous and aristocratic character.” If they have to TELL us that, they have already failed, in my view. You’re probably right…and yes, but it’s funny how so many brands (perfume, skincare, whatever) need to tell us at the top of their lungs that they are exclusive, luxurious, youthful, modern, whatever. The classic writing rule of “show, don’t tell” doesn’t apply. I know this sounds picayune–but the concept and marketing look and sound like they were put together by a committee that never met. The box says children’s fairy tale illustration, the bottle is vaguely a 1980s art deco redux, the characters Victorian, and the copy by the same folks who brought us the board game Clue (or Cluedo to you folks across the pond). I half expect the next “portraits” to be of Colonel Mustard and Mrs. Peacock…in the Billiard Room… with a candlestick! “Clue” was the first thing I thought of when I heard about this collection…but I happen to love Clue. The funny thing about the copy is that there are several versions floating around the internet. Not sure why. I’m also finding images of the next two (?) characters/fragrances in the series. As Oakland Fresca pointed out, they seem a little confused about their goal/gimmick/target audience. I don’t hate the bottles as much as others do. I’m a fan of kitsch and fugly but not for 200 bucks (there’s Nicki Minaj for cheap ). Is the picture above from the box art? I love the illustrations, myself. Yes! I have sample vials, and their cards have these illustrations, so I’m guessing the boxes will, too. A green floral with with notes of narcissus, angelica, ginger flower, hyacinth and iris really sounds lovely. Too bad Lady Blanche turned out to be so … wan. I liked the bottle caps; made me think of the sigils in Game of Thrones. Yes!! GoT. I knew they reminded me of *something* else..!